Fig. 1. Normal heart physiology introducing the third heart sound (see text for details). S1, first heart sound; S3, third heart sound; A2, aortic valve closure; P2, pulmonic valve closure. Fig. 2. Normal heart physiology introducing the fourth heart sound (see text for details). S1, first heart sound; S4, fourth heart sound; A2, aortic valve closure; P2, pulmonic valve closure. Fig. 3. Auscultatory areas, including the aortic, pulmonic, mitral, and tricuspid auscultation areas. able after the age of 30 years, S3 is considered "ventricular gallop" and is a sign of possible pathology; in most such cases, there is diastolic dysfunction associated with ventricular failure. Yet the third heart sounds sometimes persist beyond age 40 years, especially in women. The physiological fourth heart sound (S4) (Fig. 2) is a soft, low-pitched noise heard in late diastole, just before S1. S4 is generated by rapid ventricular filling during atrial systole, which causes vibrations of the left ventricular wall and the mitral apparatus. Normally, S4 is heard in infants, small children, and adults over 50 years of age. A loud S4, especially associated with shock, is a pathological sign and is referred to as an S4 gallop. The heart sounds generated by the various valves are best heard over so-called auscultatory areas, which bear the valve names, but do not specifically correspond to the anatomical locations of the valves. The aortic auscultation area is located in the second intercostal space at the right sternal border (Fig. 3). 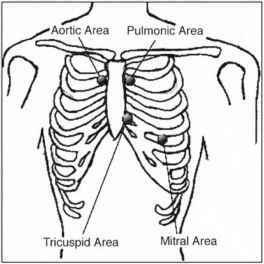 The pulmonic auscultation area is located in the second intercostal space at the left sternal border. The mitral auscultation area is found at the heart's apex, which is in the fifth intercostal space, left from the sternum. This area is also called a left ventricular or apical area. The tricuspid auscultation area is located at the left lower sternal border. For patients with a left thoracic heart position (normal situs), auscultation should begin at the cardiac apex and continue with the left lower sternal border (inflow), proceeding interspace after interspace up the left sternal border to the left base and then to the right base (outflow). This type of examination permits the clinician to think physiologically, following the inflow-outflow direction of the blood flow. To distinguish between the first and the second heart sounds easily, it should be pointed out that there is a longer pause between S2 and S1 than between S1 and S2 because systole is shorter than diastole. S1 is also of longer duration and lower pitch, and S2 is of shorter duration and higher pitch. S1 is best heard at the heart apex, and S2 is best auscultated over the aortic and pulmonic areas. Although the normal heart sounds represent normally occurring phenomena in a normal heart, cardiac pathology can change the intensity or the time occurrence of the sounds and even create new ones, often called murmurs (e.g., because of valvular or congenital anomalies). Conditions that can accentuate S1 include mitral stenosis (most often), left-to-right shunts, hyperkinetic circulatory states, accelerated atrioventricular conduction, and tricuspid stenosis. Diminished S1 can be caused by mitral and tricuspid stenosis, moderate or severe aortic regurgitation, slow atrioventricular conduction, or hypocontractility states. A diminished S1 can also be caused by thick chest walls, such as in individuals with excessively developed body musculature or in patients with emphysema. A variability in the S1 sound can be observed in states causing variation in the velocity of the atrioventricular valve closures, such as ventricular tachycardia, atrioventricular block, ventricular pacemakers, atrial fibrillation, and so on. An accentuated S2 is present in: (1) diastolic or systolic hypertension, (2) aortic coarctation, (3) aortic dilation, (4) atherosclerosis of the aorta, and (5) pulmonary hypertension; it is characterized by a loud pulmonary component of the second heart sound. A diminished S2 is detected most often with aortic valvular stenosis, pulmonic stenosis, and pulmonary emphysema. (3) increased impedance of the pulmonary vasculature (as in massive pulmonary embolism or pulmonary hypertension). Persistent splitting of the S2 refers to cases in which the aortic and pulmonic components of the second heart sound remain audible during both inspiration and exhalation. Persistent splitting may be because of a delay in the pulmonary component, as occurs with complete right bundle branch block, or can be caused by early timing of the aortic component associated with mitral insufficiencies. Directional changes in the interval of the split (greater with inspiration, lesser with exhalation) in the presence of both components define the split as persistent, but not fixed. Fixed splitting of S2 is commonly found in patients with atrial septal defects, severe pulmonic stenoses, or right ventricular failures. This term applies when the interval between the aortic and pulmonary components is not only wide and persistent, but also remains unchanged during the respiratory cycle. Paradoxical splitting refers to a reversed sequence of semilunar valve closure, with the pulmonary component (P2) preceding the aortic component (A2). Paradoxical splitting of S2 is caused by a delay in the A2 varying with the inspiratory cycle and can be caused by: (1) a complete left bundle branch block; (2) premature right ventricle contractions; (3) ventricular tachycardia; (4) severe aortic stenosis; (5) left ventricular outflow obstruction; (6) hypertrophic cardiomyopathy; (7) coronary artery disease; (8) myocarditis; or (9) congestive car-diomyopathy. • Early systolic murmur begins with S1 and ends before the midsystole. • Midsystolic murmur starts after S1 and ends before S2. • Late systolic murmur begins in the middle of systole and ends at S2. • Holosystolic murmur starts with S1 and continues for the duration of the whole systole. • Early diastolic murmur begins with S2. • Middiastolic murmur begins after S2. • Late diastolic murmur begins just before S1. • Continuous murmur continues during both systole and diastole. Based on changes in intensity, murmurs are described as: (1) crescendo, increasing in intensity; (2) decrescendo, decreasing in intensity; (3) crescendo-decrescendo, when the intensity of the murmur first increases and then decreases; and (4) plateau, for which the intensity of the murmur remains constant. (2) changes in systemic vascular resistances; (3) changes in contractility; (4) changes in heart rate or rhythm; or (5) any maneuver that affects the pressure gradients within the heart. Diagnostic maneuvers often used for altering heart sounds include inspiration, expiration, a recumbent position, a left semilateral position, exercise, standing, sitting up, or leaning forward. Inspiration causes decreased intrathoracic pressure, increased venous return, increased right ventricular preload, and decreased pulmonary vascular resistance. A voluntary inspiration can be used to increase the intensity of S3 and S4 gallops, tricuspid and pulmonic stenosis or regurgitation murmurs, or mitral and tri-cuspid clicks. Inspiration also causes splitting of S2, which is caused by prolonged right ventricular ejection. Expiration causes just the opposite—decreased venous return to the heart (preload) and decreased right-sided flow. Sounds and murmurs originating on the left side of the heart tend to be accentuated during expiration. Change in the patient's position can affect the intensity of the heart sounds as well, mostly by increasing the ventricular preload and ventricular sizes and by bringing the heart closer to the chest wall. The recumbent position accentuates murmurs of mitral and tricuspid stenosis. The left semilateral position accentuates left-sided S3 and S4, mitral opening snap, and mitral regurgitation murmurs. Standing affects general hemodynamics by pooling blood in the lower extremities and decreasing heart filling pressures and ventricular sizes. Thus, standing is used to accentuate mitral and tricuspid clicks. Sitting up accentuates the tricuspid valve opening snap, and sitting up and leaning forward are the best maneuvers for enhancing murmurs of aortic and pulmonic regurgitation or aortic stenosis murmurs. Exercise commonly causes increases in heart rates, shortens diastole, elevates left atrial pressure, and shortens the time for closure of the heart valves. Hence, physiological changes during exercise increase amplitudes of S1, S2, S3, S4, mitral opening snaps, existing mitral regurgitations or stenoses, or patent ductus arteriosus murmurs. Fig. 4. Representation of aortic stenosis murmur caused by a stenotic aortic valve. This is normally a holosystolic crescendo-decrescendo murmur best heard at the aortic auscultatory area. S1, first heart sound; S4, fourth heart sound; P2, pulmonic valve closure. Fig. 5. Representation of aortic insufficiency, an early decrescendo diastolic murmur originating in the left side of the heart and best heard over the aortic and pulmonic auscultation areas. S1, first heart sound; A2, aortic valve closure; P2, pulmonic valve closure. Fig. 6. The mitral stenosis murmur, a decrescendo-crescendo holodiastolic murmur, is caused by a stenotic mitral valve. Best heard at the mitral auscultation area, this murmur is accentuated by exercise and by assuming a recumbent position. S1, first heart sound; A2, aortic valve closure; P2, pulmonic valve closure; OS, opening snap. ing to the point of maximum excursion. The mitral valve opening snap is detected most often in cases of mitral stenosis and less often in ventricular septal defects, second or third atrio-ventricular blocks, patent ductus arteriosus, hyperthyroidism, and the like. The mitral valve opening snap is similar in quality to a normal heart sound and is often confused with a splitting of S2. The differential diagnosis of mitral valve opening snap vs other heart sound has been described in detail elsewhere and is not a topic of this chapter. The aortic stenosis murmur (Fig. 4) is caused by a stenotic aortic valve and is commonly a holosystolic crescendo-decrescendo murmur best heard at the aortic auscultatory area. The high-velocity jet within the aortic root results in radiation of the murmur upward, to the right second intercostal space, and further into the neck. Although the murmur in the second right intercostal space is harsh, noisy, and impure, the murmur heard when auscultated over the left apical area is pure and often considered musical. The harsh basal murmur is believed to be caused by the vibrations created when the high-velocity jet of blood is ejected through the aortic root. The musical second component of the aortic stenosis murmur originates from periodic high-frequency vibrations of the fibrocalcific aortic cusps and can be quite loud and heard even from a distance. When present it can be accentuated by expiration, sitting up, and leaning forward. The high-frequency apical midsystolic murmur of aortic stenosis should be distinguished from the high-frequency apical murmur of mitral regurgitation, a distinction that may be difficult or impossible, especially if the aortic component of the second heart sound is soft or absent. The murmur caused by pulmonary valve stenosis is a characteristic midsystolic murmur originating in the right side of the heart and best auscultated over the pulmonic auscultation area. This murmur begins after the first heart sound or with a pulmonary ejection sound, rises to a peak in crescendo, and then decreases in a slower decrescendo slightly before a delayed or soft pulmonary component of the second heart sound. The length and the profile of the murmur are dependent on the degree of pulmonic obstruction. The murmur caused by aortic insufficiency (Fig. 5) is an early decrescendo diastolic murmur originating in the left side of the heart and best heard over the aortic and pulmonic auscultation areas. This murmur begins with the aortic component of the second heart sound. The intensity and the configuration of such a murmur tend to reflect the volumes and rates of regurgitant flows. Radiation of this murmur to the right sternal border commonly signifies aortic root dilation, as in Marfan syndrome. In chronic aortic regurgitation, the aortic diastolic pressure always significantly exceeds the left ventricular dias-tolic pressure, so the decrescendo is subtle, and the murmur is well heard throughout diastole. The diastolic murmur of acute severe aortic regurgitation differs from the chronic aortic regurgitation murmur primarily in that the diastolic murmur is relatively short because the aortic diastolic pressure rapidly equilibrates with the rapidly rising diastolic pressure in the nondilated left ventricle. The aortic insufficiency murmur is accentuated by expiration, sitting up, or leaning forward. A pulmonary regurgitation murmur is an early diastolic murmur originating from the right side of the heart. Often, the second heart sound is split, and the murmur proceeds from its latter part. 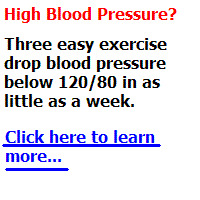 It is loud primarily because the elevated pressure exerted on the incompetent pulmonary valve begins at the moment that right ventricular pressure drops below the pulmonary arterial diastolic pressure. 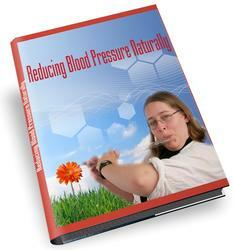 The high diastolic pressure generates high-velocity regurgitant flow and results in a high-frequency blowing murmur that may last throughout diastole. Because of the persistent and significant difference between the pulmonary arterial and right ventricular diastolic pressures, the amplitude of the murmur is usually relatively uniform throughout most of the diastole. A mitral stenosis murmur (Fig. 6) is caused by a stenotic mitral valve and is considered a decrescendo-crescendo holodiastolic murmur. It is heard best at the mitral auscultation area and is accentuated by exercise and by assuming a recumbent position. A mitral stenosis murmur that lasts up to the first heart sound, even after long cardiac cycles, indicates that the stenosis is severe enough to generate a persistent gradient even at the end of long diastoles. The murmur caused by tricuspid stenosis is middiastolic in origin and differs from the mitral stenosis middiastolic murmur in two important respects: (1) the loudness of the tricuspid murmur increases with inspiration, and (2) the tricuspid murmur is auscultated over a relatively localized area along the left lower sternal border. Detectable inspiratory increases in loud-ness occur because of augmentations of the right ventricular volumes, decreases in right ventricular diastolic pressures, and increases of the gradients and flows across the stenotic tricus-pid valve. This murmur is best detected over the left lower sternal border because it originates within the inflow portion of the right ventricle and is then transmitted to the overlying chest wall. A mitral regurgitation murmur (Fig. 7) is caused by an insufficiency of the mitral valve and is a systolic murmur best heard at the mitral auscultation area. It is accentuated by exercise and left semilateral positioning. Acute severe mitral regurgitation is often accompanied by an early systolic murmur or holosystolic murmur that has a decrescendo pattern, diminishing or ending before the second heart sound. The physiological mechanism responsible for this early systolic decrescendo murmur is primarily acute severe regurgitation into a relatively normal-size left atrium with limited distensibility. The regurgitant flow is maximal in early systole and minimal in late systole, and the murmur typically follows this pattern. Another described early systolic murmur is the tricuspid regurgitation murmur (Fig. 8), often associated with infective endocarditis. The mechanisms responsible for the timing and configuration of this murmur are analogous to those described for mitral regurgitation. It is a systolic murmur best heard at the tricuspid area and is best accentuated by inspiration. The murmurs associated with atrial septal defects (Fig. 9) are commonly systolic murmurs caused by increased blood flows through the pulmonic valves and are best heard over the pulmonic auscultation area. Most often, the atrial septal defect involves the fossa ovalis, is midseptal in location, and is of the ostium secundum type. This type of defect is a true deficiency of the atrial septum and should not be confused with a patent foramen ovale. The magnitude of the left-to-right shunt through an atrial septal defect depends on the size of the defect and the relative compliance of the ventricles as well as the relative resistances in both the pulmonary and the systemic circulations. The increased pulmonic valve flows cause a delay (splitting) in the pulmonic components of the second heart sound. The murmur commonly associated with patent ductus arteriosus (Fig. 10) is caused by a turbulent continuous flow through the ductus connecting the aorta with the main pulmonary artery. It is a continuous "machinery" murmur, heard in both systole and diastole, because aortic pressures are higher than the pressures in the pulmonary artery throughout the cardiac cycle. Other associated clinical findings in such patients include bounding peripheral pulses, an infraclavicular and interscapu-lar systolic murmur, precordial hyperactivity, hepatomegaly, and either multiple episodes of apnea and bradycardia or respiratory dependency. Fig. 7. Caused by an insufficiency of the mitral valve, the mitral regurgitation murmur is a systolic murmur best heard at the mitral auscultation area. S1, first heart sound; A2, aortic valve closure; P2, pulmonic valve closure. Fig. 8. The tricuspid regurgitation murmur is often associated with infective endocarditis. It is a systolic murmur best heard at the tricuspid area and is accentuated by inspiration. S1, first heart sound; A2, aortic valve closure; P2, pulmonic valve closure. Fig. 9. Murmurs associated with atrial septal defects are normally systolic murmurs caused by increased blood flows through the pul-monic valves; such murmurs are best heard over the pulmonic auscultation area. S1, first heart sound; A2, aortic valve closure; P2, pulmonic valve closure. Fig. 10. Commonly associated with patent ductus arteriosus, this murmur is caused by a turbulent continuous flow through the ductus connecting the aorta with the main pulmonary artery. S1, first heart sound; A2, aortic valve closure; P2, pulmonic valve closure. Fig. 11. Murmurs associated with ventricular septal defects are systolic murmurs primarily caused by blood flow from the left to the right ventricle (or the right to the left ventricle in Eisenmenger's syndrome). S1, first heart sound; A2, aortic valve closure; P2, pulmonic valve closure. from the left to the right ventricle or the right to the left ventricle in Eisenmenger's syndrome. Eisenmenger's syndrome is the reversing of left-to-right shunt in patients with atrial septal defects, ventricular septal defects, or patent ductus arteriosus. Such murmurs are best heard at the mitral auscultation area or at the heart apex. Where is an S4 auscultated?